Summer already feels like it’s just flying by! We’ve been keeping busy with finishing up our kitchen renovation and running around with the kids. Olivia graduated and will be heading off to university in the fall and Bridget has been helping at a local horse stable. I’ve been working and getting lots of use of my new kitchen. It’s a dream to cook in and was well worth the stress and money! Since it’s often just John and I around, I’ve been looking for recipes that serve two people. 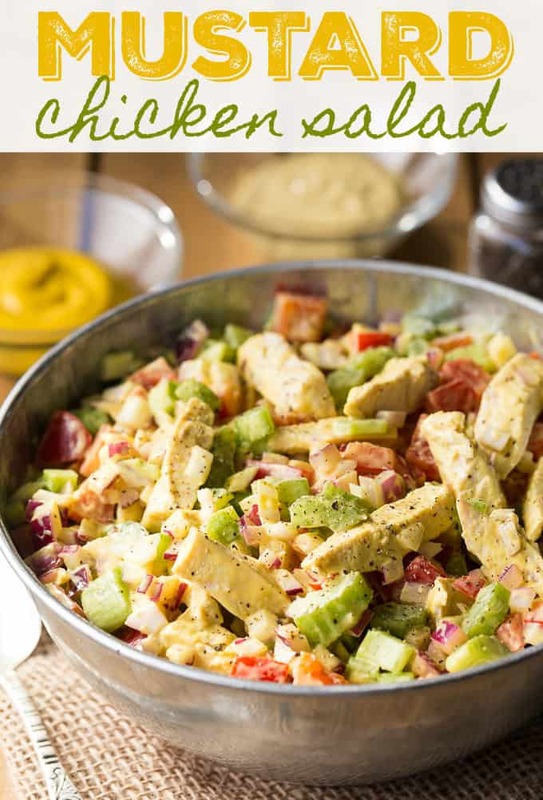 I found an awesome recipe for Mustard Chicken Salad on the Chicken Farmers of Canada website. I loved that it’s lighter, packed full of healthy veggies and protein and isn’t short on flavour. I’ve been known to use mustard as a dipping sauce. It pairs perfectly with chicken and this recipe does not disappoint. The only thing I changed was the jalapeno peppers. My grocery store was out of them. Feel free to add them in if you want some extra heat. 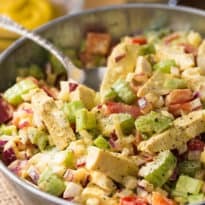 This easy salad recipe is perfect to serve at a backyard BBQ (just double or triple the recipe to feed more people) and also is wonderful for a summer picnic. It keeps nicely in the fridge and the veggies still keep their crunchy texture. Use up leftover chicken, bake or grill some chicken breasts. Breasts are my favourite cut of chicken and I use them often as main ingredients in my recipes. They are versatile, healthy, tender and flavourful. In this salad, the mustard dressing packs a big punch of flavour without being too overwhelming. When I’m shopping, I always read the labels and look for the Raised by a Canadian Farmer logo on the chicken I buy. I like knowing where my food comes from. Plus, Canadian chicken is raised to the highest possible standards for food safety and animal care. Quality matters and I know I can count on Canadian chicken to deliver my family an awesome product. If you don’t see the label at your local store, ask a manager and tell them why it matters to you. Hopefully, more retailers will get on board with the program if it’s something Canadians want. Check out the recipe index on the Chicken Farmers of Canada site. They have lots of lighter chicken meals and salads that are perfect for summer. I recommend bookmarking their page so you can find it quickly when you need some inspiration. I’d love to hear what summer chicken recipes you are eating these days. I’m always looking for new ones to try! You might also like this Greek Chicken Salad or picnic food. Healthy and full of delicious flavour and texture! Serve this simple salad at your next BBQ or picnic. Add chicken and vegetables to a medium bowl. Add yellow mustard, Dijon mustard and Ranch dressing. Stir to combine. Season with salt and pepper. Store in the refrigerator until ready to serve. I make chicken Caesar salad as usually a meal. Super yummy!! Grilled vegetables with Shrimp spiced with Hoisin sauce! When I make BBQ chicken, I like to have coleslaw, potato salad and a nice simple garden salad. I love bbq chicken. Could eat it every day! We like tossing grilled chicken strips in with our spring mix salad, along with lots of fresh fruit and raspberry dressing… so good! Bulgur Chicken Burgers with Yogurt Sauce would be great for a backyard BBQ. Normally when we do a BBQ my husband does the meat and I do the sides like potato salad and raw veggies. I love a Greek salad 🙂 a favourite in the summer. We love potato salad as a side dish to barbecues! 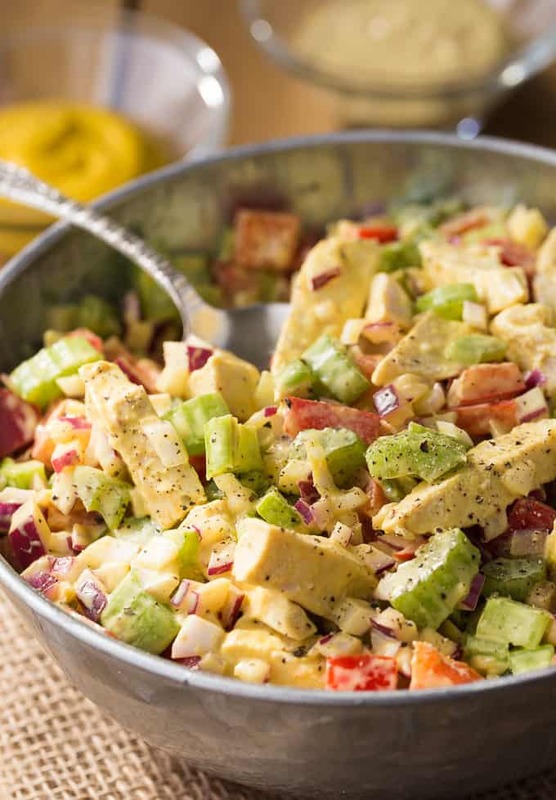 This chicken salad looks like an awesome choice for lunches at the office. I’m going to try it this week! I like to have a Caesar Chicken Salad with the chicken being grilled first. I do a similar Pasta & Chicken salad with mayo and mustard. I love that I can do it ahead and it makes a great lunch for those busy days. I like Chicken Avocado and Black Bean Salad. I love a good pasta chicken salad with pesto. My fav Chicken side dish is a mexican bean salad, with shredded slow cooked chicken added in. I love serving grilled chicken salad with a variety of dressings or a chicken Caesar salad. I love warm chicken Cesar salad – using the freshly done BBQ chicken – oh it tastes so good!! Kinda want one now! Pasta and chicken salad is my favorite using all fresh ingredients from our garden. Delicious! We use the leftovers for a Chicken Caesar Salad! For backyard BBQs, we definitely take advantage of the grill after the meat is done and place a few wrapped potatoes for easy baked potatoes. Even better – once the potatoes are done, add shredded bbq chicken and a few other ingredients and everyone gets to enjoy the easiest loaded chicken baked potatoes. Total favorite around here. Chicken/Broccoli casserole is a family favourite. Chicken Caesar is my Fav Chicken salad. I love adding grilled chicken to my pasta salads. I have a one-dish chicken meal with chicken thighs, tomatoes and onions with balsamic glaze and a hint of lime oil. It’s delish and easy to make! I am so glad that the jalapeno peppers were sold out, lol. I’d probably have to cut down on the mustard too but I do love chicken so I’d give this a try in the summertime. I love making a basic chicken salad with a little bit of mayo, dijon, and a lot of hot sauce!